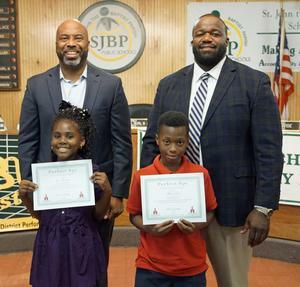 Student Jaz Thompson, who scored a perfect 850 in English language arts on the LEAP test, and Theron Gross, who scored a perfect 850 in math on the LEAP test are recognized by St. John the Baptist Parish Public School District Superintendent Kevin George and School Board President Albert “Ali” Burl III at the St. John the Baptist Parish School Board meeting on Oct. 18. Students scoring perfect on the LEAP who were not present are Reese Bogart and Amari Anderson in ELA and Kaitlyn Gomez in E2. East St. John High School 10th-grader Niall Pierce was recognized for scoring a 30 on the ACT test by St. John the Baptist Parish Public School District Superintendent Kevin George and School Board President Albert “Ali” Burl III during the St. John the Baptist Parish School Board meeting on Oct. 18. 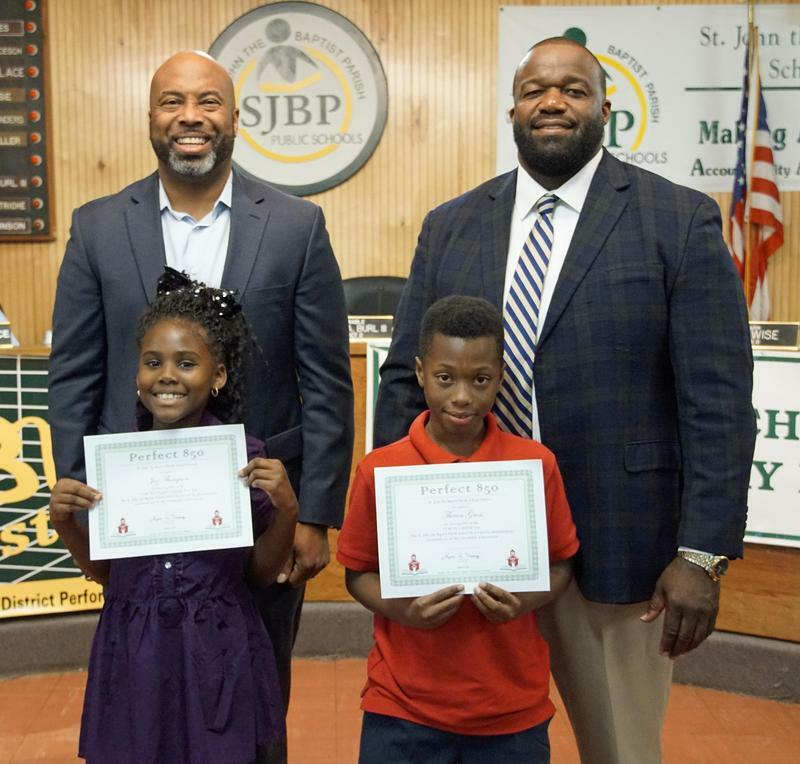 Graduates who also scored high were Deiray Ceaser, 28; Wesley Patterson, 28; Donald Watkins, 28; Sela Pierce, 29; Anthony Ward, 29; Carlin Bartholomew, 30; Brian Price, 30; and Joshua Gilliam, 33, along with 10th-grader Tamiyah Gross, 28.